We know about the gendered wage gaps in the workplace. It’s old news that women are wildly underrepresented in top leadership positions at companies across the nation. And it’s clear that men need to be on board in order to for women to achieve equity in the workplace. Men have a central role in improving the workplace as we move into the future. But to be effective in accomplishing productive solutions, we need to scratch beneath the surface and look beyond salary and the corner office. Most men believe that all people should have the same opportunities based on qualifications, not gender. What about that guy at the conference table — you know, the one who means well but still puts a sexist foot in his mouth. Allow me to suggest a few tips to share with co-workers about why gender equity matters and what men can do in taking a lead. As I explain in my book Men and Feminism, masculine privilege is the idea that society awards certain unearned perks and advantages on men simply because they are male. Sometimes this privilege is really obvious, like the fact that Congress remains overwhelmingly male. But masculine privilege also flies under the radar. Institutional practices and ideological beliefs about masculine superiority seem so normal or natural that we’ve learned not to notice when a man’s opinion is taken more seriously than a woman’s. And, let’s face it. The workplace is nothing if not an institution. Exposing invisible patterns and practices allows us to think critically about the links between gender privilege and sexism. One way masculine privilege operates is in how men (and women) are taught to see sexism as “individual acts of meanness,” says scholar Peggy McIntosh. What’s really going on, though, is that sexism is supported by invisible systems that perpetuate and maintain dominance for men as a group. 1. Engage don’t interrupt. Be quiet. Don’t talk-over others. Communication is a two-way street, and some people have been socialized to cross that street more slowly than others. Research shows that women speak less when they’re outnumbered while men are groomed for assertiveness. Simply put: talk less; listen more. 2. Wait for a response before continuing. Ask more questions and don’t assume you know more than the person you’re speaking to. 3. Remember: authority, expertise and strength come in all shapes, sizes, colors, and wardrobes. A hot manicure does not preclude a hot IQ as 16-year-old Mensa-member Lauren Marbe can attest. There might not be a perfect solution, but we can certainly start the process, and we can easily commit earnestly to change. Men have a crucial role in promoting this workplace change by refusing to be bystanders to the problem. 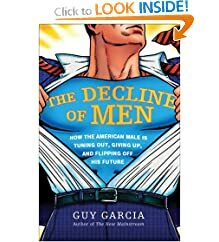 Just a quick hit today on a book I’m about to get my hands on, titled The Decline of Men: How the American Male Is Tuning Out, Giving Up, and Flipping Off His Future , by Guy Garcia. Coming on the heels of Michael Kimmel’s most excellent Guyland: The Perilous World Where Boys Become Men , I’m eager to see how it, um, measures up. While Barack is dressed identically to JFK, down to the wristwatch (signifier of male diligence during downtime), it is ironically Michelle who seems the more work-ready in the 2008 image. She is much more formal here than Jackie, as befitting a contemporary professional mom, yet it is also possible that the zetgeist is not yet ready for a black First Lady in leisure attire. Certainly this is true in corporate America, where non-white professionals can still feel the need to one-up their white colleagues in formality just to achieve equal parity. At a time when Sarah Palin’s suitability for office is questioned even by liberals in the context of motherhood, it is significant that it is Barack whom the daughters embrace. Here we have a signifier not only of progressive gender politics but of the increasing importance of family values in the political sphere. The Obamas are in that sense a tighter unit here than the Kennedys; in the Kennedy image Jack looks true to the pre-Betty Friedan era, a man in proximity to his family yet not unduly “enmeshed”, which implicitly allowed him the freedom to work and “play” outside the domestic realm. Not so Obama, who must project utter wholesomeness in a post-Lewinsky landscape. Hey, XY Files: Masculinity…or something else? Debbie’s post on presidential masculinity in the XY Files got me thinking. My FSC colleague Lisa Eck studies hybridity and postcolonial literature: at the gym the other day, sheÂ noted that in our public discourse we don’t have much language to talk about “hybrid” status (some day it won’t be a buzz word: it means multi-cultural, multi-racial, multi-ethnic). Obama=black candidate, McCain=white candidate is how it goes. We don’t know how to listen, observe, or theorize (eek!) about hybridity. So as I was thinking about what you, and Jackson, and Ellen Goodman, and others have been talking about, I thought, wow, Obama offers a kind of hybrid gender performance to go with his hybrid racial identity, and it is working damn well! Obama isn’t hepped up on cartoon masculinity like McCainâ€¦and yet it doesn’t make sense to think of him as using “feminine” styles in any definitive or exclusive sense. (For cartoon femininity, see Palin, Sarah.) Finally, he certainly is not androgynous in that misfit, uncomfortable “Pat” sense (remember Pat on Saturday Night Live?) But his repertoire is wide, and he is using all sorts of masculine and feminine skills that are working well–and he is avoiding the ones that don’t. Maybe with the rise of Obama (and other leaders like him?!?!?) we will have the opportunity to sharpen ourÂ ability to notice how the plot unfolds when we are observing a candidate who contains and is directly influenced by multiple statuses all at once. And that goes for race as well as gender. One way that I think about Obama’sÂ successful gender expression comes from social psychology. Research on masculinity and femininity shows that children who are androgynousâ€“that is they use skills that are typically associated with being a boy and those associated with being a girlâ€“have greater social intelligence. They are more effective socially, better liked, more accomplished, and more appealing as partners.Â When you think about the gender (or race) puzzles unfolding in front of us, remember that what you are seeing is not triumph ofÂ masculinity orÂ femininity so much as the triumph of something new, something that works. Well now that it’s Obama vs. McCain, the gender of leadership has become, well, a little homogenized.Â It’s dude v. dude.Â Again.Â And one of my newfound heroes Jackson Katz (educator, author, filmmaker, bigtime FOF — that’s friend of feminism, mind you) is currently working on a book about â€œpresidential masculinityâ€Â that I can’t wait to read. According to an article in UCSF Today, Katz says this election is nothing new when it comes to the important role that race and gender have historically played in campaigns for the White House.Â Â While the level of diversity among this yearâ€™s crop of candidates is of course unprecedented, Katz suggests that the battle between the two presidential contenders still boils down to a question of who best represents the stereotypically masculine qualities of a leader: strength, steadfastness and vitality. Or is it?Â Isn’t the Hillary/Sarah effect (ew – I hate putting them so close together like that) still having an impact on the way we talk about leadership’s gender these days?Â Â GWP readers J.K. Gayle and Renee Cramer had some interesting comments on this all back in February, when HRC was still in the race.Â I’d love to pick up the thread again, now that the debates are all black man vs. white man.Â Read the rest from Katz, and let me know what you think! 1. Men with sexist views earn more dough. According to a new study published in the Journal of Applied Psychology, sexist men in the workplace are likely to out-earn their more modern thinking counterparts. Um, really? The BBC reports, and feministing and Broadsheet respond. 2. More single men live at home with Mom and Dad than do single women. While as recently as 1980, only six percent of men reached their early 40s without marrying (compared to five percent of women), by 2004, that percentage had increased to 16.5 percent of men (and 12.5 percent of women). Even more telling, 55 percent of American men aged 18 to 24 live with their parents and 13 percent between 25 to 34 years of age still live at home, compared to only eight percent of women. Read the rest in HNN. 3. Teenage fathers are on the decline. But boys who become Baby Daddies face unique challenges as young men thrust into responsibility. As reported in ABC News, Levi Johnston, the expectant father of Bristol Palin’s unborn child, joins a small minority of his peers by becoming a teenage father. Overall, only 1.7 percent of teenage males were fathers in 2002, a decline since the early 1990s. In fact, the majority of teen mothers are impregnated by men age 20 and older. And ABC News reports that while there are many support services for teen mothers, teen fathers are often left out, despite studies showing that they are more prone to delinquency, reduced educational attainment, financial hardship and unstable marriage patterns. I read with interest an article on single dads by choice in this weekend’s NYTimes, titled “The Bachelor Life Includes a Family.” Says a 46-year old doctor from Miami who is interviewed for the piece, â€œIâ€™ve always felt that I wanted fatherhood to be a part of my life,â€ he said. â€œItâ€™s just a core part of who Iâ€™ve always been. I absolutely would want a partner, but I couldnâ€™t let my life wait for that random event.â€ Sound familiar, ladies? Seems men, too, hear the ticking of their biological clock. Interesting, and also raises tough questions. Does anyone know a single father by choice? I’d like to interview a bunch for my next book. Please let me know, and many thanks!